How to best inspect the occurrence of climate change from a first person perspective? The simplest answer would be to reside on a ice-berg, and then measure its melting phase over the specific period of time. However, this solution is seemingly dangerous, impractical and hence ludicrous. Or is it? 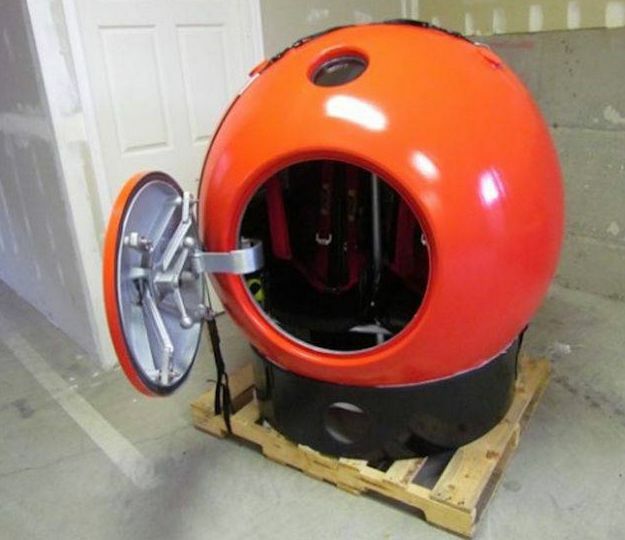 Well, according to Italian explorer Alex Bellini, that is exactly what he plans to do – with the aid of the above pictured pod-like contraption. Originally envisaged by engineer Julian Sharpe as a rescue compartment that can fit in up to ten people during tsunamis, Bellini will utilize the floating mechanism for his year-long habitation atop a breakaway ice-berg from Greenland’s coast. The circular pod will be modified for this adventurous purpose, with the stripping of the excess weight – including the seats that would make way for more habitable area inside. This space-saving exercise would transform the interior into a pseudo one-bedroom apartment, albeit with a surrounding high-strength aircraft-grade aluminum shell. But of course, beyond monocoque structural reinforcement, there is always the element of human psychology, and how it would cope with the scope of solitude (on an ice-berg). 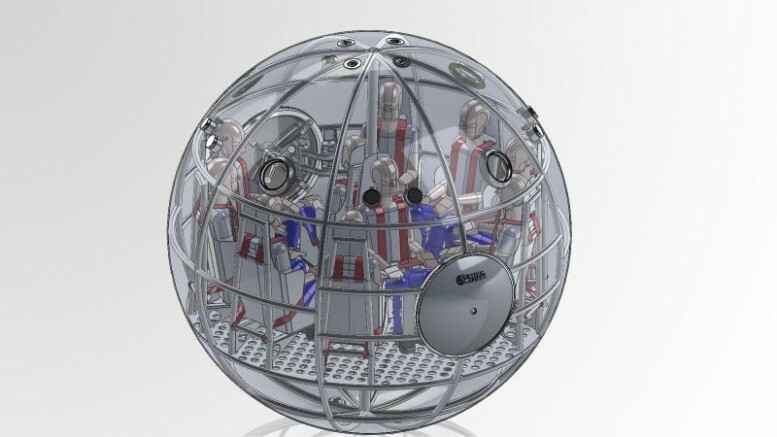 For this, the ‘homeliness’ factor of the aluminum orb will be enhanced with the induction of solar panels and wind turbines for the much-needed electricity (and presumably WiFi and a GPS beacon). This will be complemented by a built-in water-tank, a treadmill-like bike to keep the occupier occupied, and a natural-light mimicking illumination system. And, in case you are wondering, the nauseous effect from the rolling of globle-shaped compartment will be mitigated by an inner-mounted lining of roller balls that would matche with the outer rotational degree, thus keeping the floor still. It’s strong enough to survive a storm at sea or getting crushed between two icebergs. It will rest on top of the ice using either its own weight or a specially designed stand that will detach if the berg rolls. The circular shape is crucial for avoiding a crushing blow. The capsule will just roll off any incoming mass, and the water will provide an equal and opposite reaction to any force exerted on the capsule. A multicurved surface is almost uncrushable. If you imagine shooting an arrow at a wooden ball, unless you hit dead center, it’ll ricochet. The Jules Verne-esque adventure is all set to take place within a year’s time. And what’s more – Bellini even plans to pen a book that would aptly document and discuss his year-long feat atop the desolation of an ice-berg.